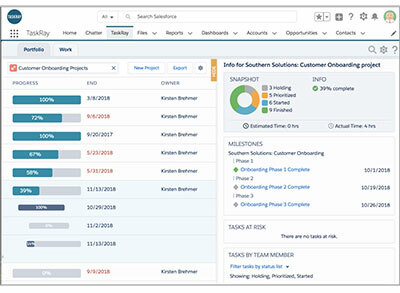 Get a free, 30-day trial of TaskRay - bundled with a free trial of Salesforce! Test the power of the world's best onboarding / customer success app inside the world's best CRM. This free, 30-day trial option gives you a fully functioning version of TaskRay—bundled within a free trial setup of Salesforce. You get the best of both worlds in an environment that's totally turnkey, quick to set up and easy to use (no Salesforce admin experience required). We offer a number of free resources with guidance to help you get the most out of your trial/demo, including help videos, instructional webinars, and access to our Support site. Ready to give it a try? Fill out the form on the right to get started. Need more information, or have a question? Click here to schedule a quick call with a TaskRay expert.